HOPLITE is the new flagship ATX Mid Tower from ENERMAX. Its high-performance cooling system can house up to six fans. The product designers put an emphasis on every single detail to create an ideal case for the latest PC systems. The versatile front doors allow for a quick and convenient access to the 12cm front fan and to the hot-swap bays at the bottom of the front. 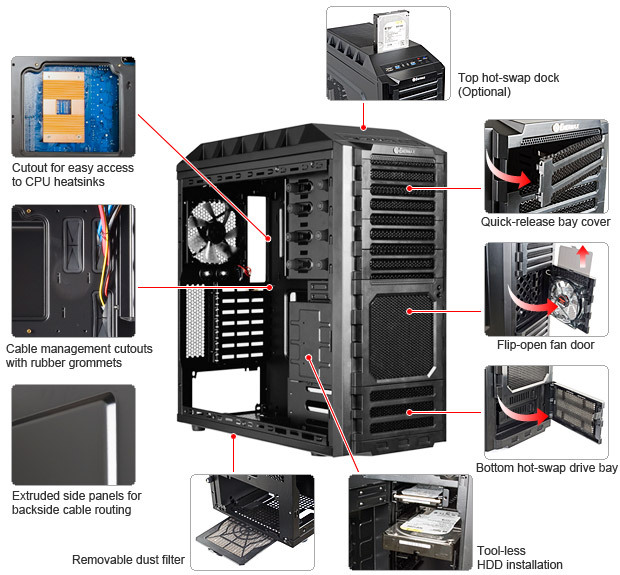 The internal arrangement is designed for best possible usability, with screw-less, quick release fasteners for optical and hard drives, as well as the excellent cable management system that includes space behind the extruded right side panel for a flexible cable routing behind the mainboard tray. On the top, users can find a hot-swap docking station for 2.5 or 3.5" HDD/SSD as well as two USB ports. Fans of the renowned ENERMAX TWISTER BEARING LED technology will be pleased to hear about the pre-installed 12cm VEGAS front fan. It can combine two different colors (blue and red) with eleven unique light effects.